Champagne Fever has been made favourite for the 2015 Cheltenham Gold Cup by some bookmakers after a comfortable win in the Clonmel Oil Chase. The 4-5 favourite, ridden by Paul Townend, was a six-length victor from runner-up Alderwood, with veteran Sizing Europe sixth on heavy ground. Trainer Willie Mullins said Champagne Fever could run in next month's King George VI Chase at Kempton. "He is entitled to go there and a flat right-handed track will suit," he said. "I expect his jumping to improve. I don't see the point in going back to two miles with him." 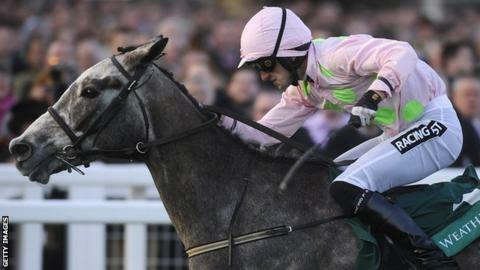 Mullins said the John Durkan Chase at Punchestown on 7 December was also under consideration for his horse. Champagne Fever was cut to about 6-1, from 12-1, for the King George and is as low as 8-1 for the Gold Cup in March. At Clonmel, Townend replaced Ruby Walsh, who was serving a one-day suspension.